Remove the 3 rings from the game! and put them back in the original position! 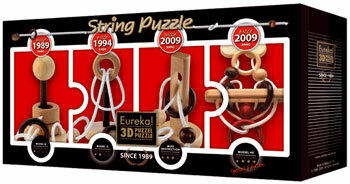 Specialy to celebrate the 20th anniversary of our Eureka 3D String Puzzles, we will offer a 4X design, from September 2009. This is exactly 20 years after the start of our first production of puzzles. This 4X puzzle will be available in a collectable box also holding 3 other puzzles. 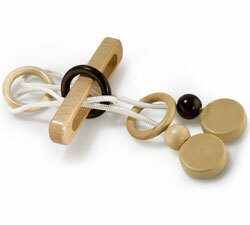 See the Jubilee Eureka 3D Puzzles .